For dogs, physical activity and mental stimulation spells a happy, healthy life. Amongst other activities that combine both is dog agility - an increasingly popular canine sport that promotes human-canine communication and exercises your dog in more ways than one. 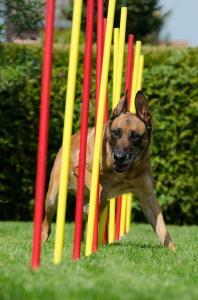 Agility involves a variety of obstacles, such as tunnels, weave poles, jumps and teeter-totters, which the handler must direct the dog through as quickly and accurately as they can. To do well, a dog should be focused, confident and energetic, as well as fully in-tune with its handler to respond to their cues. Just as parents may encourage their children to take up sports or extracurricular activities to develop key skills, dogs can develop many of the same skills when placed in an engaging and challenging situation. If you're interested in improving your dog's training and getting active, then agility could be just the thing for you. Here are a handful of benefits to be found in dog agility, which might just encourage you to take up the sport! 1) Exercise. This is perhaps the most obvious benefit of dog agility, which is great for dogs with excess energy to burn. Navigating agility courses challenges both the body and mind so dogs are properly tired at its end. Not only will agility help strengthen your dog's muscles, it will also improve his coordination, flexibility and endurance, in turn benefiting his all-round fitness. Being a handler also carries a similar benefit as it involves running alongside your dog, assisting him as he jumps etc. In short, dog agility is the perfect workout for both of you! 2) Reinforces good behaviours. Agility is a sport that combines both skill and training, with particular focus on obedience. Off-leash reliability is essential if your dog is to excel at agility and have a clear round, avoiding faults. As the involvement of the handler is limited to just voice and body signals, your dog must be attentive to subtle instructions and be able to respond to them with speed and accuracy. But being able to walk on leash in a calm and controlled manner at the start of the event is also critical, so agility not only teaches running and jumping, but the importance of self-control. 3) Strengthens the bond between dog and handler. Because the handler is limited in what they can do, there must be the utmost trust between the pair if the dog is to negotiate as many as 20 obstacles by himself. Communication is key here and the better the communication, the greater the trust, confidence and success of the competing pair. Of course, this kind of relationship on-course will also have a positive effect off-course too. 4) The social factor. Many people enjoy dog agility (not to mention their dogs!) which means there is ample opportunity to make friends in the sport. This is surely the icing on top of the cake when you think of all the other incredible benefits! This article has confirmed that I will give dogs agility ago.Thank you. I have just read your article and thought I would drop you a line to share my experience with you. My wife and I have a 10 year old Jack Russell girl - Poppy. When she was young she went to both obedience training (non punishment - obviously!) and also agility - which she loved and was very good at. When she was 18 months old we got a second dog, Pickle and, because of my wife's job, she couldn't attend classes with me and the difficulty of handling two dogs in the same class - Poppy stopped going. Unfortunately our youngest died last November aged eight having lived through pancreatic cancer for the previous two and a half years. Although we imagined, because we didn't have Pickle for the first 18 months of Poppy's life, that Poppy would cope well with the loss of her 'sister', the opposite was true. Poppy became scared in familiar circumstance, she was clearly at a loss in her life, to the extent that I gave up my part time job to stay at home with her and try to get her back to normal (our vet told us that dogs do have a sense of loss - equivalent to our feelings of grief.) My being home with her did help and she was getting better. I then had the idea of taking her back to agility classes (which started again just a couple of weeks ago when the decent weather returned.) My idea was that it would allow her to mix with other dogs that she had not met before as well as get her out and about in different circumstances and give her a bit more exercise. I was not expecting too much as she has not been to agility for about eight years. The point of this long, protracted, story is that I am stunned at the difference this had made to her emotionally after such a short time. From moment one she seemed to remember that she had done it before (she certainly remembered more about how to run the course than I did!) - she mixed really well with six dogs that she had never met before (both on and off lead) and she was very clearly both happy and excited to be there. Since we started back at agility she is just like her old self - it has been an amazing change in her in such a short time. I've just had to retire my six year old cocker from agility ,miss it so much so does he , the quality time the bond with your dog is something else. I bought a little dog agility set online for the garden, and me and my dog absolutely love it.